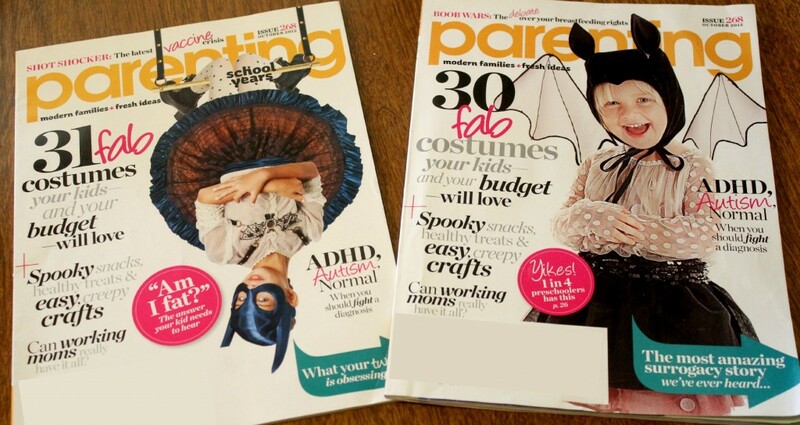 So, I had a super exciting thing happen recently that was a rather big deal for me… one of my creations was featured in this month’s Parenting Magazine! 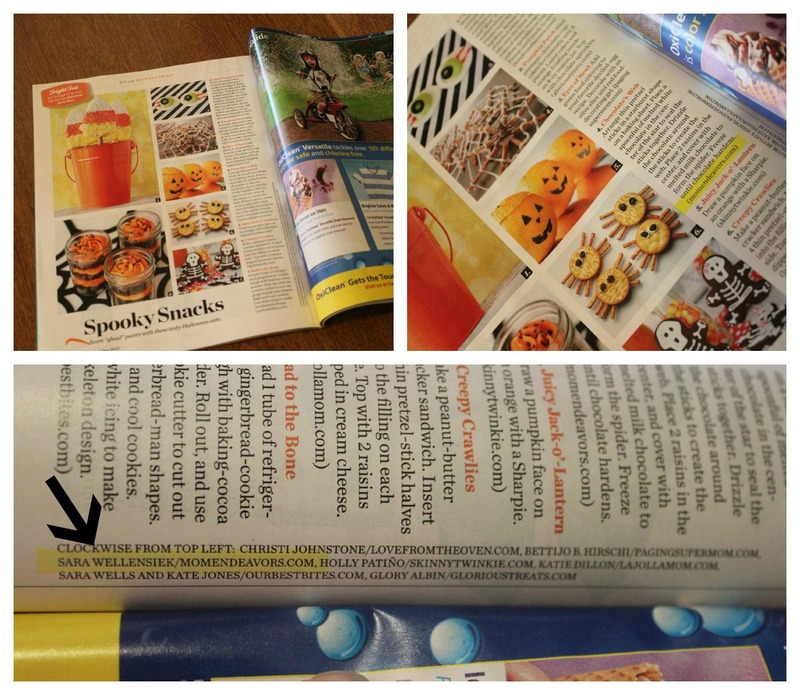 My name & “Mom Endeavors” in print!!! Squueeeee! 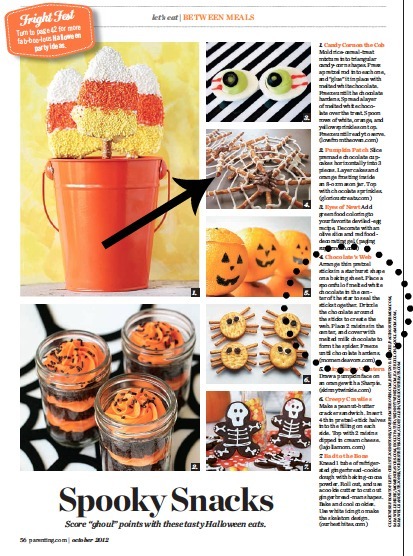 Months ago, I was contacted by a Parenting Magazine editor about possibly including my spider web snacks for a Halloween feature. (I’m guessing she found them via Pinterest because, as of writing this point, that recipe has been pinned 103,ooo+ times!!! Craziness!) I was super excited to be contacted, but honestly wasn’t sure I’d make the final editing cut. Imagine then my shock & excitement when I checked back in with her a couple of weeks ago and she replied with a “thank you” & this page layout attached… It was so fun to see. But, then my goal was to get my hands on a copy and actually hold it in my hands. Thanks to multiple friends sharing their copies with me, we now have a few. After all, how often does one actually get to be IN a magazine. 🙂 It’s a pretty cool feeling to flip through the pages and see one of my project photos along with my name in it! What’s a little extra cool is that it ran in both the Parenting Early Years (page 56) and the Parenting School Years (page 50) editions! And, for those who don’t get the magazine, there’s a feature here on Parenting.com! Perhaps the most amazing thing though about the whole situation is that I had been blogging only 1 month when I posted those spider web pretzels. The photos were all taken with a little point-and-shoot as it was before I had my “fancy camera”. Now, two years later, one of my first little posts is one of the most popular posts on the site, has been pinned over 100,000 times, and is printed in a magazine with a circulation over 2 million! Wow! So, you never know what might happen with something you put out there!! Sara, that’s so awesome and such an exciting thing!! I think it’s always really fun when someone recognizes your hard work and creativity like this! Congrats lady! You deserve it! Aw, thanks, Andrea! It was super exciting, indeed!